Are you looking for a Melissa, Tx Moving Company? 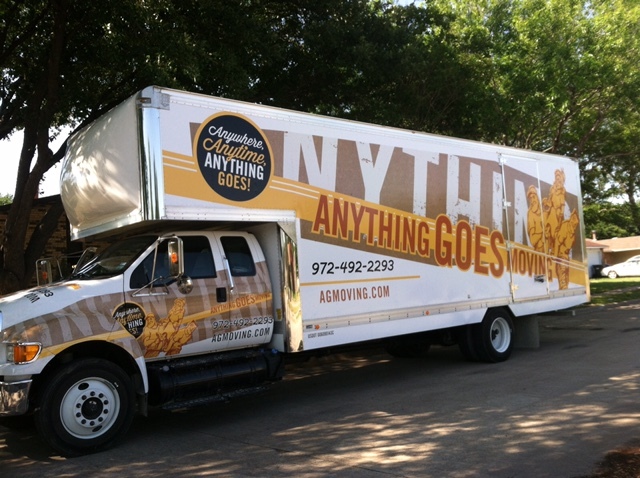 Anything Goes Moving is your local Moving service in Melissa, Tx, providing packing, moving and storage services for Residential Homes and Offices. Our professional moving service is friendly and fast! We have new Melissa Moving Trucks to make sure that your move is done on time, every time. Do you need packing services in Melissa, Tx? We offer full packing services utilizing the best packing practices so that your valuables arrive in the same condition they were packed and moved. We can pack kitchens, bathrooms, living rooms, antiques, garages and more! To find out more about our pricing on packing services in Melissa, give Don a call. As a local moving company, we pride ourselves in providing the best Moving services in Melissa. Our Movers are friendly and we work hard to move all of our Clients on time so that they get where they need to be, when they need to be there. No more worrying about Moving trucks not showing up on time or movers not working at a pace to get things moved on time. We'll work hard to earn your business so that anytime you need a Moving Company in Melissa, you call Anything Goes Moving! For a free Moving quote in Melissa, give Don a call today at 214-232-7478.